Club Penguin Cheats by Mimo777 Club Penguin Cheats by Mimo777: New Earth day Party Safe Chat Phrases! Club Penguin has new safe chat phrases for Earth Day! 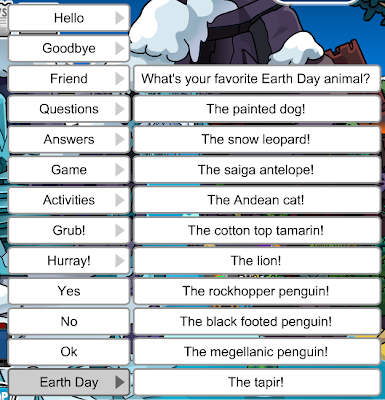 Now you can ask people what there favorite Earth Day animal is! I ♥ The Rockhopper Penguin Outfit!